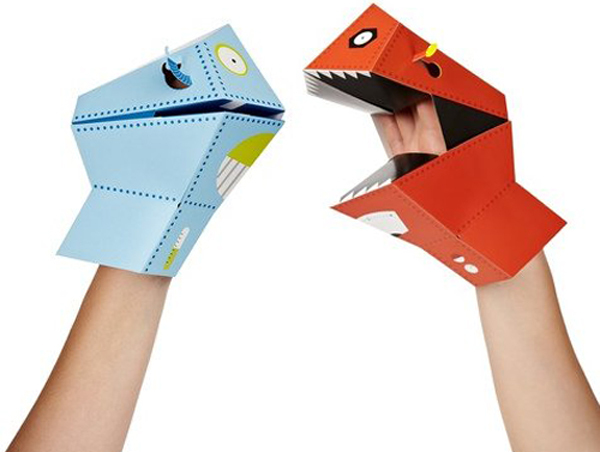 Talk to the hand with Robot Hand Puppets! Hand puppets have come a long way since the sock puppets of my childhood. Not that there’s anything wrong with a sock puppet, but making your hands into robots – that’s the kind of awesome puppetry dreams are made of! Stuck for a rainy day activity? These Robot Hand Puppet packs have all the makings for a great craft activity without a lot of fuss and materials – plus they’re something small children will love to have a hand in putting together. The puppet pack contains four different robot characters colour printed on to sheets of card, all you need to do is fold, glue into place and presto, you have a robot to fit a hand (no matter its size)! If robots aren’t your thing, there are also fabulous Safari (pack contains tiger, zebra, giraffe and monkey puppets) and Farm Hand Puppet packs (containing chicken, pig, cow and dog), all priced $15 from Top 3 By Design.